I was sick all day today, but around 7 pm I was feeling a little better and needed to go check out some pillows that were on sale at Restoration Hardware. I've been really into gray lately and I noticed they had the perfect color of gray on their walls. 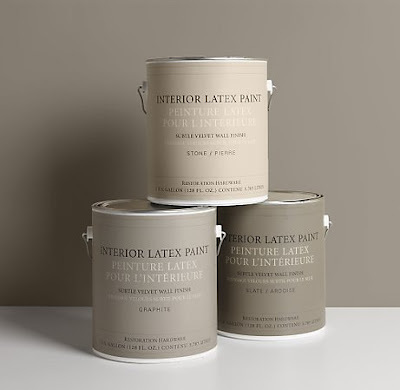 I was chatting about it with the sales woman and she said that they had just painted and talking about how it was the color "slate", it took me second, but then I realized that she was talking about Restoration Hardware's own paint. How did I not know they sold paint? Turns out they have some great colors. Everything is grayed and muted...very soothing and pretty, very Restoration Hardware. And they sell sample pots for just $3.95, which I love. It's always a good idea to paint a small area or piece of poster board before you commit to the whole room. What color are your cabinets? If they are white I say definitely go for it! If your cabinets are dark, you might want to go with a lighter color of paint. But all in all, I think slate would look great in a kitchen, don't let the small size deter you. I fell in love with this Slate color when I saw it this wkend and had to have it in my house, I painted our master bath with it and its gorgeous!!! We have white cabinets with bronze fixtures, white garden tub, white shower.. LOVE it! Do you have any decor ideas, or accent colors that you think would go great? I wondered if a splash of red here or there would work? I'm considering my small (only) bathroom this weekend with slate from RH as well. I've contemplated this for one month (if not more) now. Small house, 2 beds 1 bath, that is currently all white... including the wooden floors that aren't in the greatest shape. I'm doing my last round of renovations/remodel and would actually like to paint the whole house slate. Is that a bad idea? Another option was paint living room kitchen, and hallway stone... but slate in bathroom and 2 bedrooms... don't have money to replace floors (plus i like the scuffs and darker spots that are beginning to settle in to it). Last option is keep rest of house white but paint the bathroom and 2 bedrooms slate. I have vintage and modern pieces mixed in my home. Any feedback would be greatly appreciated. Thanks. My kitchen is painted slate and I LOVE IT! my cabinets are off white as well as my crown moulding! You want go wrong with this paint!